The Transportation Association of Canada Annual Conference was held recently in Fredericton. 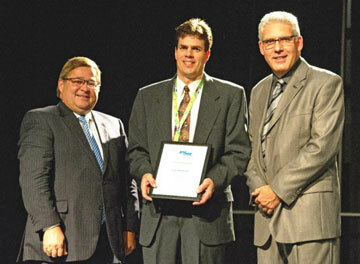 Three UNB Civil Engineers were recognized for their work at that conference. Eric Hildebrand, professor in civil engineering, was the winner of the 2012 Award of Academic Merit from the Transportation Association of Canada. The Award of Academic Merit recognizes individuals who have made a long-term contribution to the advancement of the academic field and to the development of tomorrow's transportation leaders. This award was presented at the TAC Annual Banquet and is one of the four categories awarded to recognize someone who has made an outstanding contribution to transportation in Canada. Trevor Hanson, professor of civil engineering, and Coady Cameron, MScE Candidate, were awarded Best Technical Poster Award by the TAC Pavements Standing Committee for their poster presentation Can Smartphones Collect IRI data? Congratulations to Eric, Trevor, and Coady.